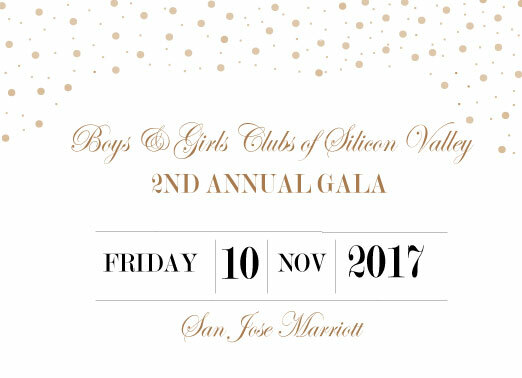 bBoys & Girls Clubs of Silicon Valley presents the second annual gala on Friday, November 10! The event commemorates this year's accomplishments and hard work. Community leaders, family, friends and staff come together to celebrate the passionate young individuals fostering diversity and leadership. The Gala recognizes the effort of one individual in particular, the young leader of the new generation, The Youth of the Year. Boys & Girls Club of Silicon Valley presents the second annual gala on Friday, November 10! The event commemorates this year's achievements and hard work. Community leaders, family, friends and staff come together to celebrate the passionate young individuals fostering diversity and leadership. The Gala recognizes the effort of one individual in particular, the young leader of the new generation, The Youth of the Year. The Gala includes a dinner, live auction, special guests and a performance by the Club youth. Register for Boys & Girls Club of Silicon Valley's Gala today!